The friendly and professional team of chiropodists are all registered with the Health & Care Professions Council (HCPC) and The Society of Chiropodists and Podiatrists, and aim to provide outstanding chiropody and podiatry services to improve your health. Offering assessments, diagnostics and a wide range of treatments for the feet and lower limbs, Sussex Foot Centre also offers specialist treatments. This includes ingrown toenails, diagnostic ultrasounds, diabetic foot care, wide fitting comfort shoes and more. 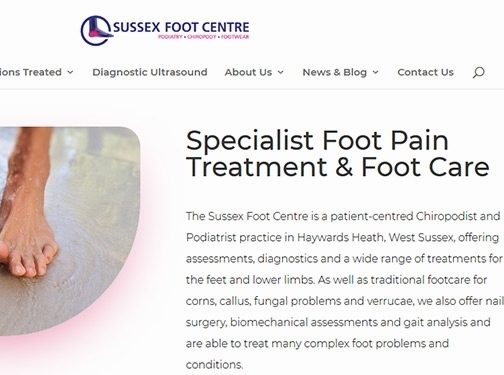 Visit the Sussex Foot Centre website today for more information on all the services provided and to book an appointment. Disabled access to the practice is available, as well as home visits for those with mobility difficulties. UK (Haywards Heath, Sussex) based business providing chiropidy treatments. Website includes details of treatments provided, testimonials and case studies, details of business premises, associations, full contact details. Company website has been online since 2017 according to web.archive.org.